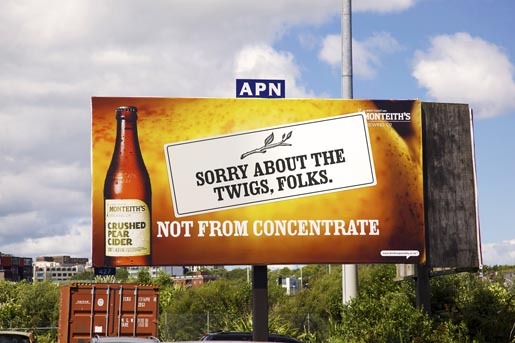 Monteith’s Crushed Cider, the New Zealand cider owned by DB Breweries, is made from whole sun-ripened Nelson apples or pears, ruthlessly crushed to retain their natural flavour. 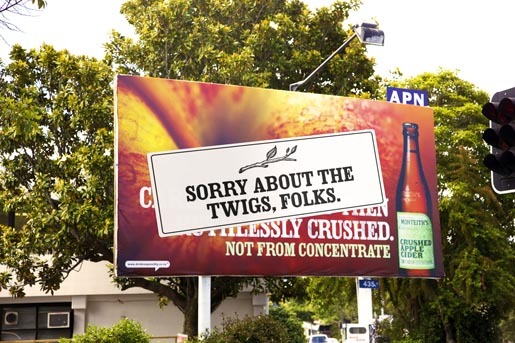 To remind the public that the cider is 100% not from concentrate, DB Breweries and Colenso BBDO slipped real apple tree twigs into Monteith’s cider boxes. Within a week, New Zealanders were asking for an explanation via facebook, radio and the Monteith’s call centre. 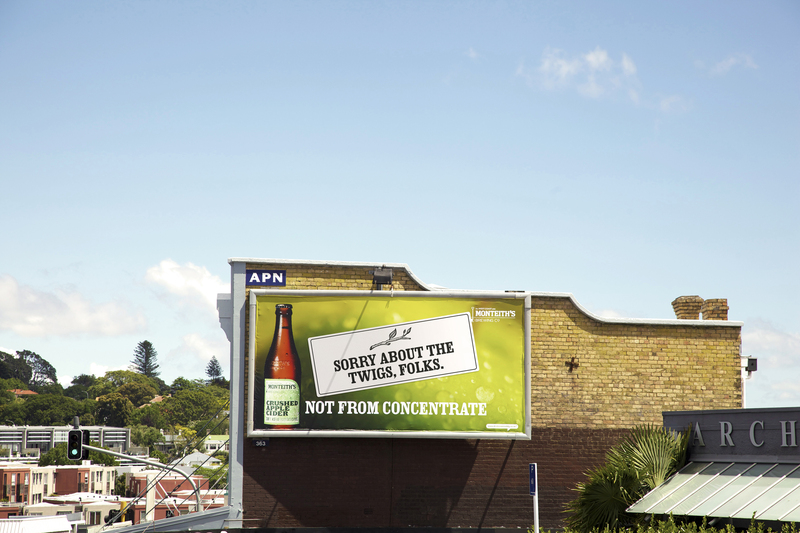 After two weeks, Monteith’s apologised for the mistake through PR, press, patched billboards and on-pack stickers. 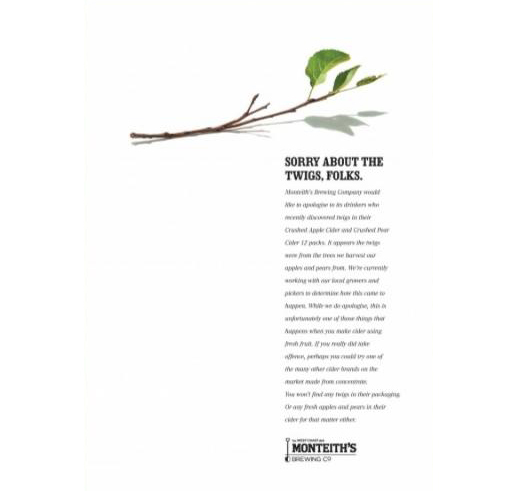 Every apology spread the simple message: the fruit in Monteith’s cider comes from a tree, not a can. The campaign won a Gold Outdoor Lion, Gold, Silver and Bronze Promo & Activation Lions, and a Bronze Media Lion at Cannes International Festival of Creativity. 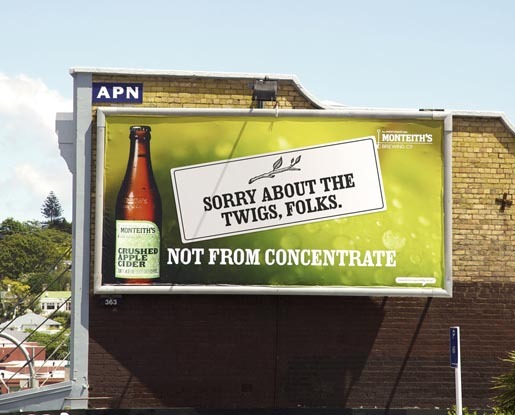 The Sorry About The Twigs campaign was developed at Colenso BBDO, Auckland, by creative chairman Nick Worthington, art director James Tucker, copywriter Simon Vicars, creative Aaron Turk, group account director Marcelle Baker, account director Saya Tran, planner James Hurman, agency producer Sheriden Derby, account manager James Cummins, working with Monteith’s marketing manager Jen Macindoe. Creative work was produced by photographers Steven Boniface and Simon Harper at Harper Photographics, retoucher Kevin Hyde at Imagecraft and designer Mike Davison.